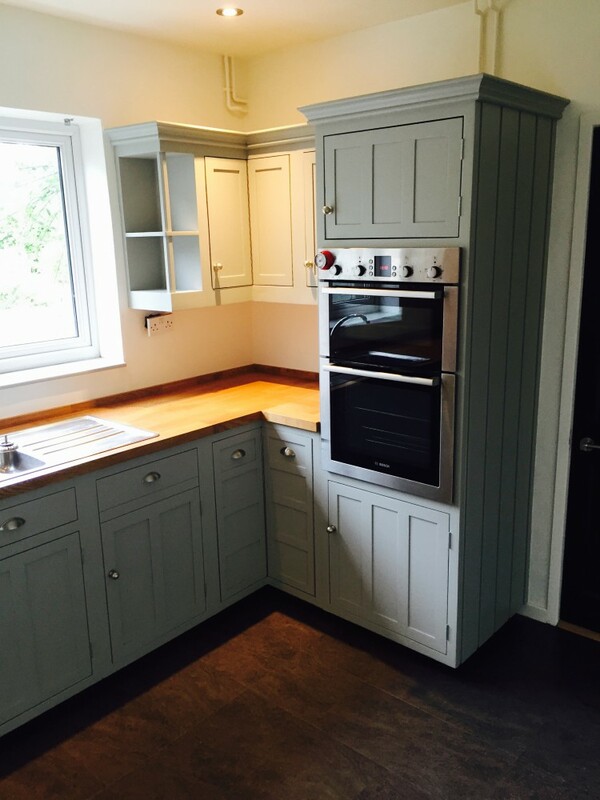 This Hand Painted Kitchen project in the West Midlands is a great illustration of the type of Kitchens that I paint, as the Traditional Painter member for the West Midlands – Hand Painted Kitchen Specialist. 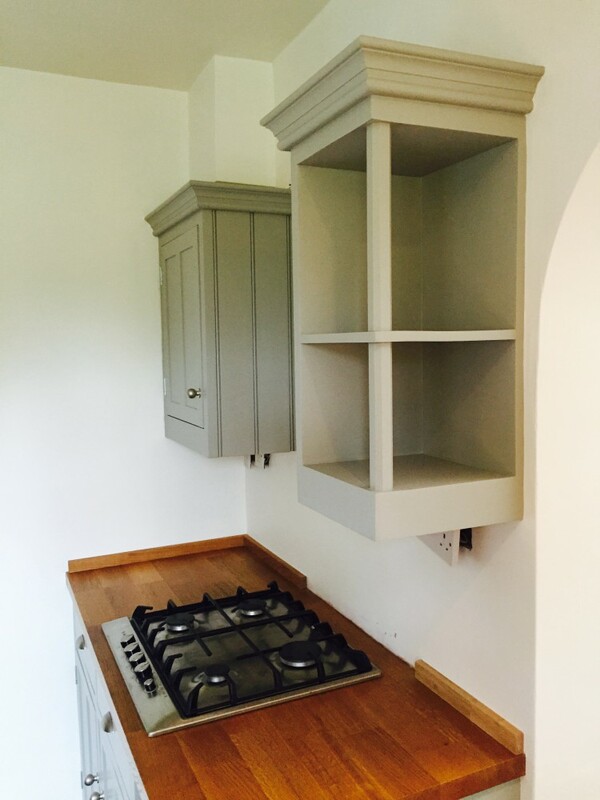 My clients came to me with a varnished pine Kitchen that was installed 25 – 30 years ago… they also had a Utility Room that they decided to replace the units for new (laminate) and have me Hand Paint them to match in seamlessly with their soon to be Hand Painted wooden Kitchen. 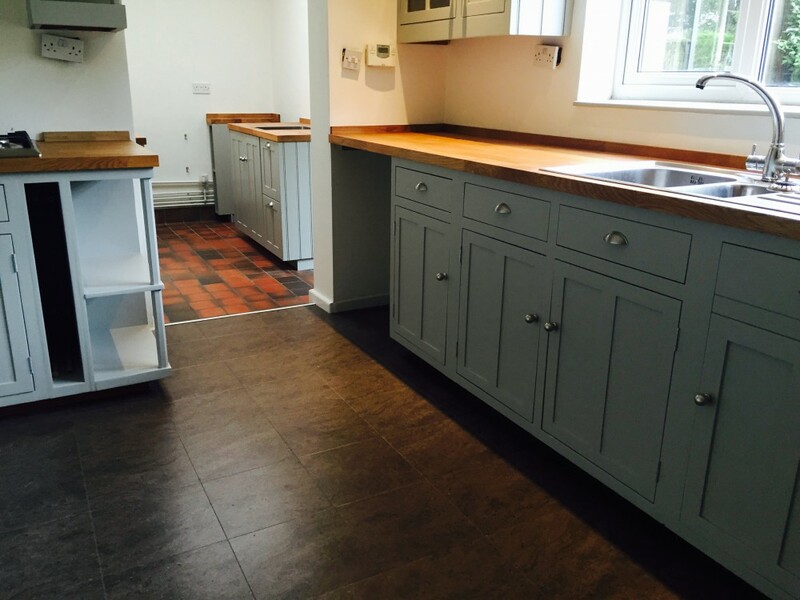 Before I arrived on site they had a new floor, worktops and units installed (and bespoke customised) by my preferred Kitchen Fitter – Adrian Cullen (great work as ever Adrian! 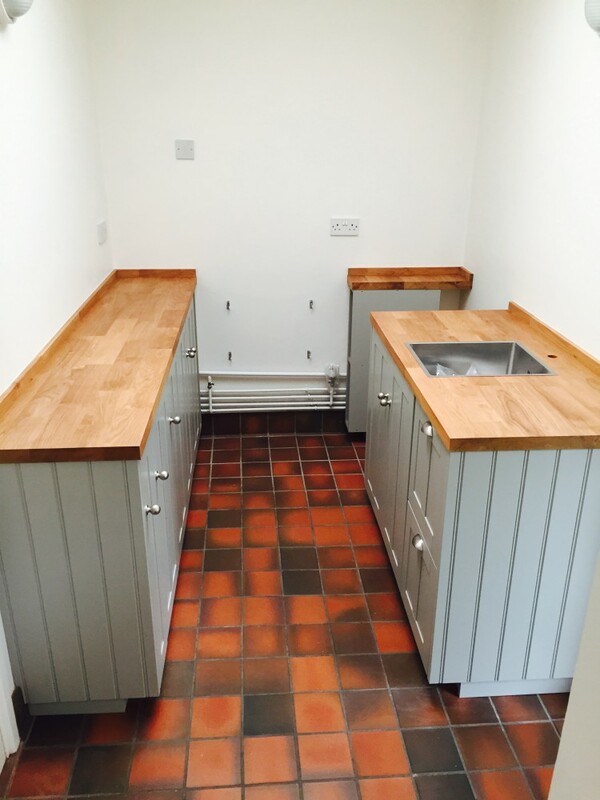 )… once I was on site, I protected all of these surfaces with 1200 grade lining paper and taped all edges of the new solid oak worktops. I changed my degreasing system for this project, slightly, and used Fluxaf’s Graffiti Clean instead of their Pro Clean product – I was extremely impressed by the results! ; the Graffiti Clean actually changes the grease into a thick solid that is easy to remove. Once degreased, I sanded down with my tried and trusted “Dust-Free” sanding system from Mirka and Festool and applied the first coat of High Adhesion Sealer/Primer – Pegaprim Isofix tinted to the top coat colour; equivalent of “Lamp Room Gray”. Once the primer was dry I filled, sanded back with 320 grade Abranet abrasive. 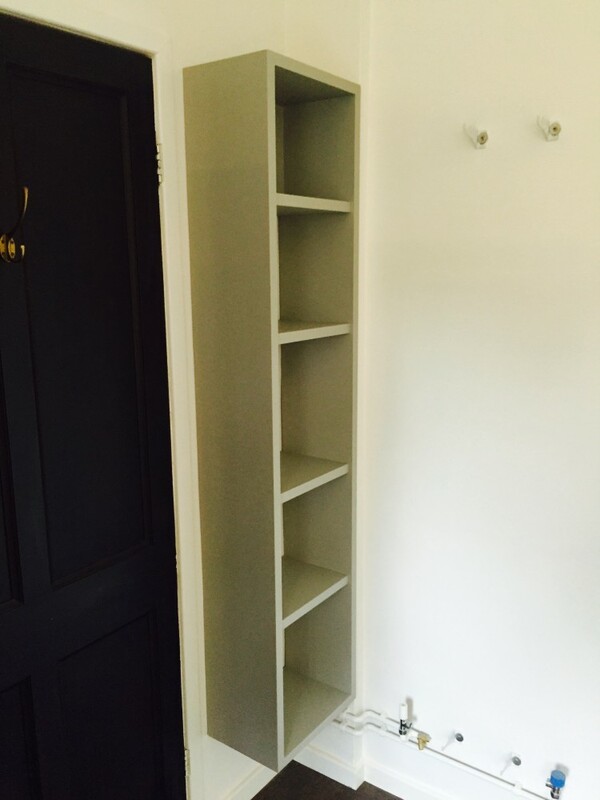 the second coat was then applied, followed by the top coats of Tikkurila Helmi Matt (5% sheen)… new handles and knobs were fitted and Tahhhhh-dahhhhh! job done! 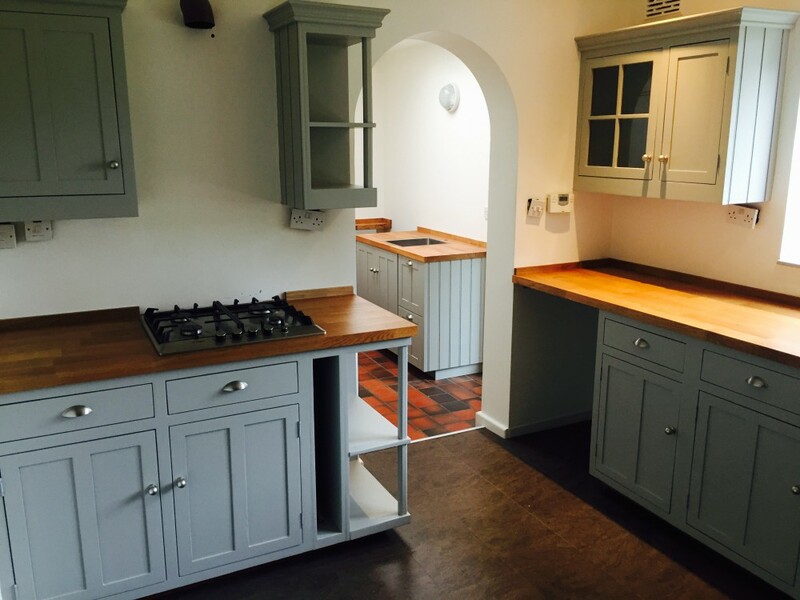 “Our kitchen, installed 25-30 years ago, was very tired looking and in need of refurbishment/replacement. Being of good quality we decided to refurbish. traditionalpainter.com was one of the first sites we came across and this led us to Martin. 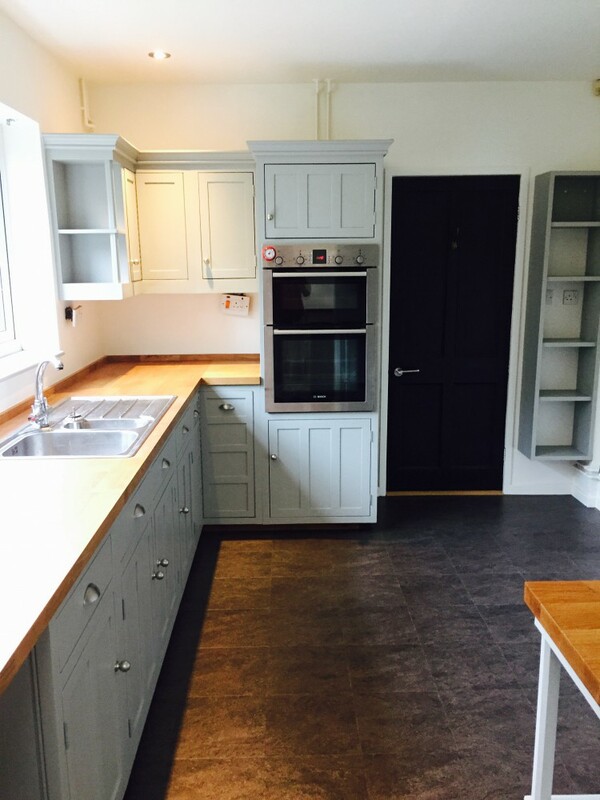 What luck, following emails and telephone conversations – which only confirmed we had made the right choice – Martin arrived, protected the new flooring and work surfaces, removed an embarrassing amount of grime from all the surfaces to be painted, sanded with an amazing dust collection system then primed and painted to a marvellous standard. All with a minimum amount of disruption. 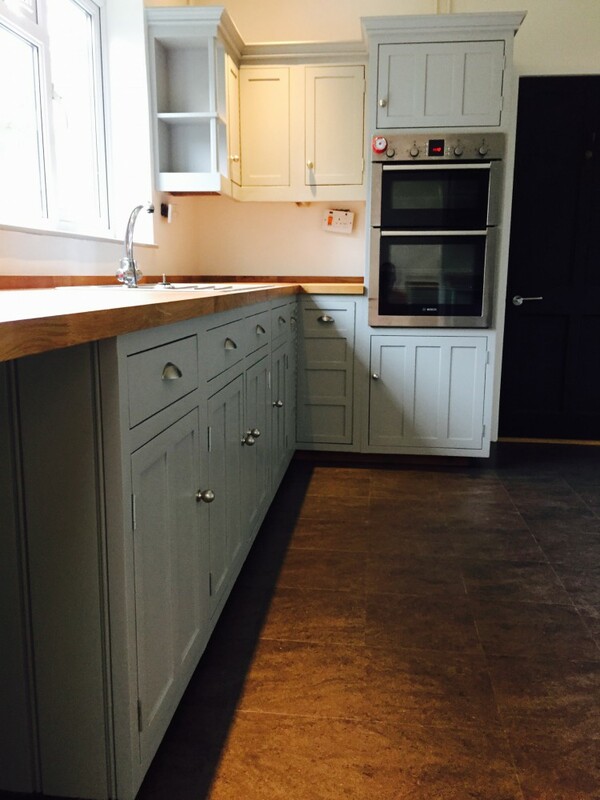 This entry was posted in Uncategorized and tagged Abranet, Adrian Cullen, Festool, Hand Painted Kitchen, Hand Painted Kitchen Specialist, IKEA, Kitchen Painter, Laminate Kitchen, Mirka, Oak Worktop, Pegaprim Isofix, Pine Kitchen, Tikkurila Helmi, Traditional Painter, West Midlands on August 14, 2015 by mjguestltdblog.